As mentioned in the preceding section, stress can be considered as any deviation in environmental condition from optimal for the overall performance of the plant species under reference. If you recall the environmental factors, you can tell the various kinds of stress that plants may be subjected to. 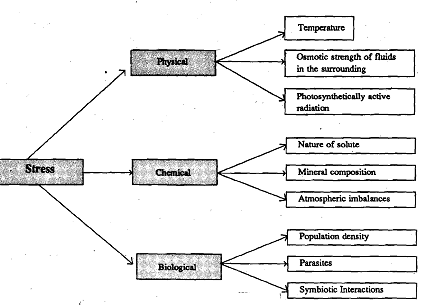 A broad outline on the nature of possible environmental stress is illustrated in Figure. If a cell were placed in a hypertonic solution what could it do to protect itself?